1. Cook the noodles according to the directions on the packet. When cooked, drain and toss in the sesame oil. 2. Heat the vegetable oil in a non-stick frying pan or wok. Use a high setting to cook the ginger, garlic and chillies for 30 seconds then add the spring onions, red pepper, broccoli florets and prawns. 3. Cook until the prawns turn pink (around 4 minutes). Then add pak choi, noodles, lime juice, soy sauce, chilli sauce and sherry to the pan. 4. Continue cooking until the mixture is heated through and serve immediately. 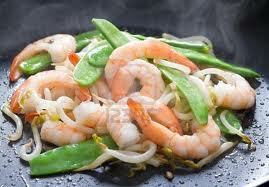 and prawns.